In the last post, I discussed how wealth and income are mostly interchangeable, as debt allows one to convert income into wealth, and investing allows one to convert wealth into income. I noted one primary advantage of wealth (at least in the United States): income from invested wealth is taxed at about half the rate of income from labor. For answering hypotheticals like “would you rather have a guaranteed job that earns $250k/year or a lump sum of $3 million?” the difference in tax rates might be one of the most important factors to consider. But from a more pragmatic “how should I make financial decisions in my day to day life?” perspective, there is another, more important reason why wealth is more powerful than income. The main reason that wealth is more powerful than income is that it is more robust. It’s relatively easy to lose your source of income: for many people the majority of their income comes from one job, and losing that job means you’ve suddenly lost all your income. There are many reasons you might lose your job, and they’re often out of your control. You may be able to find another job quickly and recover your income, but it could also take months or years to find a new job, and/or you might need to take a pay cut. So income is far from guaranteed over the course of your working career. Wealth, assuming it is invested in a well diversified portfolio, is much more stable since it doesn’t depend on a single industry or company like income does. There are times when your wealth will decrease, but the worst recessions in recent history have at most cut wealth (or more precisely: stock index values) in half, and in all of these cases the markets recovered within the next decade. This doesn’t mean there will never be a market destroying apocalyptic depression, but if that happened, it would wipe out all sources of income as well. Wealth is also more robust than income because converting it to income through investing results in a positive feedback loop of building more wealth. If any of the income that you generate is disposable, you can invest that excess, and your wealth will grow through the power of compound interest. Converting income to temporary wealth through the use of debt doesn’t have a comparable positive feedback loop. Your debt being paid off has no influence on your underlying income, so after you’re able to pay off debt you’re typically back where you started. And in the unfortunate case where you lose your income before your debts have been paid, compound interest will be working against you. Your debts will keep growing while you can’t make payments on them, without providing you any additional value. So, from a personal finance perspective, it is important to accumulate wealth. But you should do this by accumulating true wealth, slowly saving money from your disposable income over time. Leveraging income to borrow large sums of money won’t truly make you wealthy – it may feel like it while you get to spend money you don’t have, but if you ever want to retire you can’t depend on income alone. With the democratic presidential primary elections starting to take shape, financial inequality is one of the biggest issues, if not the biggest issue, being debated. I remember similar arguments during the run up to the 2016 election, which were essentially the entire impetus for Bernie running for president. I also remember a specific conversation I had during that time, where an acquaintance of mine was making the case that wealth and the estate tax are the wrong way to target inequality – they argued that the source of wealth is income, so the best solution would be increasing income taxes. This was long before I had done my dive into personal finance, so I hadn’t spent much time thinking about wealth vs. income, and didn’t argue against this view. If someone made the same argument to me today however, I would be more inclined to push back. With a very simple idea (which I was very familiar with at that point, but apparently hadn’t thought about in any substantial way), we can see that wealth and income are essentially interchangeable. That idea is interest. We’re all familiar with interest. The most common scenarios where it comes up are receiving interest on a bank account or paying interest on a loan. But what you might not have realized, at least not explicitly, is that interest is a way of transforming wealth into income or vice versa. When you take out a loan, you are giving up some of your income for access to wealth. And when you invest or lend money, you are receiving income in exchange for giving someone else access to your wealth. Of course, while interest provides some mechanisms to convert between income and wealth, it does not make them identically equivalent. There are a few important differences from a more explicitly personal finance perspective, but I’ll save those issues for another post. The important difference I’ll cover today comes from how the government (at least in the USA) sees and taxes income vs. wealth. For the great majority of people in the US, the main way they are taxed is via their earned income. When they perform labor that earns them money, a percentage of it goes to the government. The percentage depends on different factors, but the most important one is how much you earn. Someone earning a modest salary might be taxed between 10-20%, while someone earning millions of dollar annually would be taxed at almost 40% (at least in theory – in practice there are tricks for them to pay less). However, if you are very rich or part of a very rich family, there are two other taxes that will apply to you: capital gains tax and the estate tax. The capital gains tax applies to income that you make from your money (i.e., investments) rather than your labor, and the estate tax applies to wealth transferred to heirs after a rich person dies. These taxes work in a similar way to income tax, where higher “earners” pay higher rates. I won’t go into detail about the estate tax here, since it is harder to compare to the income tax, but for capital gains it is fairly apples to apples. In both cases, you are taxed on money received, it’s just the source of the money that differs: the income tax affects money you received for performing work, while the capital gains tax affects money you received for having money and investing it. So how does the government see wealth and income differently? The income tax rates are roughly double the capital gains tax rates. In terms of how much you owe Uncle Sam, it’s much better to “earn” your money through having wealth than to earn it by working. This is one piece of the puzzle of why wealth accumulates and inequality grows, and why inequality is now such a central issue in American politics. I think all of these would be beneficial for the country, but of the three I’m most enthusiastic about the wealth tax. It addresses the reality that wealth is more powerful that income, and cuts directly to the problem of wealth inequality most directly. I’m a bit surprised no one is championing an increase in the capital gains tax (at least, no one that I’m aware of). That would be another more direct route to addressing wealth inequality, and wouldn’t add any tax burden to the majority of Americans. There are very few media franchises that I identify as a fan of. This isn’t because there aren’t plenty of things I enjoy, but because in the age of the internet, my perceived barrier to fandom has become incredibly high. I was reminded of this recently while watching a recent episode of Um, Actually, a YouTube game show (I guess technically it’s a dropout.tv game show) that tests participants’ knowledge of minutia in various nerdy lore. I was surprised that none of the contestants were able to answer a question about Game of Thrones correctly, when I knew the answer before the host had even finished reading it. The subject of the question is directly referenced in the TV show, and possibly in the books as well (but I don’t remember for sure), so the question was not about some tiny detail hidden in the depths of Game of Thrones mythopoeia, it was about a prominent part of the series’ world building. I’ve read the books, and I watched the first few seasons of the Game of Thrones TV series, but I lost interest and stopped following it somewhere in the 3rd or 4th season. Hence, I would not consider myself a Game of Thrones fan. It’s possible I’d maintain this distinction even without the internet, since I know plenty of people who participate in watch parties every Sunday night when new episodes are airing, but with the internet, I definitely couldn’t consider myself a “real fan”. Being aware of communities full of people devoting seemingly endless hours to dissecting the series’ content and creating content of their own makes my having read the books and knowing the answer to a trivia question seem inconsequential in comparison. The internet also reminds me of the knowledge (/obsession) that I lack about things I do consider myself a fan of. For example, it would be hard to deny that I’m a fan of Rocket League, but I don’t think I’d be able to make it through the end of this Rocket League specific game show, and I know very little about the eSports (that is, professional competitive play) side of Rocket League. Maybe others would gatekeep me from Rocket League fandom, but there’s no doubt in my mind that I’m a real fan. I don’t really have a point to make about this phenomenon or a statement to make about whether I think it’s good or bad. It’s just something I’ve observed about myself and how I relate to media and the communities that are out there on the internet. All the more power to those who consider themselves fans of all sorts of games, movies, books, and shows, but the depths of all the fandoms out there make it hard for me to count myself as part of more than just a few. In my last post I referred to my current approach to many of my endeavors as “vague discipline” (perhaps as opposed to “focused discipline”). I’m not sure this is a real phrase, so I figured I would start this post by elaborating on what exactly I mean. If I employ vague discipline in an area of my life, it means that I consistently carve out time/effort/energy for that part of my life and/or stick to a loose set of rules, but I’m not making a focused effort to always improve, and I don’t self-reflect and change my rules and approach if something isn’t going quite the way I’d like. Some examples where I have applied vague discipline and it has been successful are personal finance and my PhD. The extent of my personal finance strategy pretty much boils down to two guidelines: don’t spend money on things that aren’t worth the cost and use savings for diverse and productive investments. Following those guidelines, I’ve been able to maintain a 20-30% savings rate since I started my PhD, which isn’t as productive as the focused discipline of people who follow the FIRE movement, but puts me in much better shape than most Americans. While I worked on my PhD, my whole approach was pretty much just to show up every day and try to learn something. I didn’t finish as quickly or with as many publications as people I know who took a more focused approach, but in the end I still successfully completed my PhD. The best example of an area I have been applying vague discipline with results I am not happy with is rock climbing. Rock climbing has been my main sport for over five years now, and for most of that time I didn’t strive for anything specific beyond going to the gym 2-4 times per week. In my first 6 months climbing I saw clear improvements, but after that any progress became much slower and there have been periods of regression as well. In the past ~6 months in particular, I haven’t felt that strong on the wall. There are many potential reasons, but after some reflection I think that it’s because my changing work schedule has led to me cutting climbing sessions shorter, oftentimes before I’ve really even started to push myself. My other resolution for 2019 has to do with an area where I haven’t really been applying discipline, vague or otherwise. Since I started my third part time job in August, I’ve returned back to basically a full time work schedule, which means that all my personal projects have fallen by the wayside. It may have actually started before the job, judging by my post history on the blog. While the blog is not equivalent to my personal projects, they are definitely connected, and so my second resolution for 2019 is to publish at least one blog post per month. My hope is that taking time to write (and think about whatever I’m writing about) will reignite progress on a project or two. But even if that doesn’t happen, the reflection involved in writing should help me be more intentional about other areas of my life – namely my work and career. So here’s to 2019 – I doubt it will have as much self-reflection as the middle years of my PhD, but it should at least have more than 2018. I’ve never really made New Year’s resolutions in the past. I’m all for self improvement, and while I’ve made many resolutions over the years related to diet, exercise, personal finance, dental hygiene, etc. that match typical New Year’s resolutions, I never waited until the start of the new year to make them. My attitude has always been that if a change is important enough for me to make, I’ll make it as soon as I realize the change is necessary/beneficial. While the start of the year can be a good time to reflect on potential changes to make in your life, it’s not inherently better than any other times. For this reason, I’ve often bought into the stereotype that most New Year’s resolutions only last through January – if you need an arbitrary date to make a change, is the change really important enough for you to stick with it? However this year it looks likely that I’ll be using the arbitrary date of January 1st (or maybe just the month of January, I’m not sure I’ll have my resolutions sorted out in SMART fashion in the next two days) to launch some resolutions. Luckily for me, it seems the stereotype is wrong and most resolutioners are at least partially successful. There are two main factors motivating this for me. The first is that while in some ways 2018 was a big year for me (I got married! ), in other ways it felt stagnant. I think this is mostly due to the fact that 2018 was the first year I wasn’t a student. And while I’ve picked jobs so far that lead to my day to day life being similar to when I was a student, I don’t have the overarching structure where my small, everyday progress is leading to a graduation/degree. Even though I have chances to learn every day, I don’t think I’ve done enough thinking about where I want that learning to take me – and if I don’t particularly care, I haven’t justified that to myself. The second factor is that my wife is in the middle of some fitness goals where she’s made inspiring progress. Seeing her progress is a good reminder that taking a structured approach to tackling goals is way more productive than the vague discipline I’ve been employing recently. So while I am perhaps resolved to have a resolution or two for 2019, I have yet to figure out the specifics. The short term resolution I will make for now is that within the next two weeks I’ll determine what resolution(s) I want to make for 2019 and write about it in a follow up blog post. Edit: I forgot a big part of why I don’t like new year’s resolutions, but now that we’re a week into January I’ve been reminded. Around the new year, resolutioners make the gym and produce section of the grocery store crowded and unpleasant. If they spread out the times that they decided to start their resolutions, this wouldn’t happen. Some anecdotal evidence against the article I linked above is that by the end of January, everything is always back to normal. Edit: I finally found the existing term for the idea I was exploring in this post. Basically, this post was an exercise in re-deriving Internal rate of return (IRR) and giving it a worse name and acronym. In my last post, I discussed how to analyze the “investment performance” of buying goods in bulk or on sale, by applying the idea of ROI (or more accurately, CAGR) to those purchases. As a refresher, ROI can be calculated from the follow formula, and traditional investments are typically expected to have an ROI of ~5-15% long term. One point I briefly mentioned in that post was that it’s more valuable to receive payouts from an investment earlier, but for simplicity we treated the payouts from buying in bulk as being received in a lump sum once everything had been used. This wasn’t just for the simplicity of that post, it was also because (as far as I know) there is no version of ROI that accounts for an investment with recurring costs or recurring earnings. If you look for how to calculate ROI/CAGR, the equations all assume a single starting value and a single final value – there’s no room to account for extending or unwinding a position over the course of holding an investment. If you continuously buy and sell shares of a stock, for instance, you can track the ROI of a particular share by pinpointing the date you bought and sold it, but there’s no equation to to figure out the overall ROI that all the shares of that stock have provided you. In this post I’d like to propose a method for characterizing the performance of an investment that has recurring costs/earnings (or more broadly speaking, doesn’t have a single fixed purchase date and a single fixed sell date). I’m sure someone else could come up with a much better name and acronym, but here I’ll call this metric Return On Investment for Recurring Costs/Earnings, or ROIRCE. ROIRCE borrows from how Net Present Value is calculated, in terms of how it discounts costs and earnings in the future. where is the time in years from the beginning of the first investment where the associated cost is incurred or the associated earning is collected. The left side of the equation is the effective total cost of the investment, while the right side of the equation is the effective total earnings from the investment, with each discounted based on how long they took to realize. The reason I was reminded of this idea (which I had intended to write about since I wrote the last post, but never got around to) was a post on the personal finance subreddit about whether after winning a lotto jackpot, one should take the lump sum or monthly payments. Unfortunately I can’t find the exact post anymore, but the options were either to take $60k in a lump sum, or $1k/month for 10 years (which totals to $120k). The actual post was full of good advice about practical concerns like which option is more advantageous from tax and psychological perspectives, but in this post we’ll consider the options in a simple, tax-free world, and approach the choice purely mathematically. One response argued that it’s better to take the lump sum of $60k, since if you invested it you could expect to have >$120k by the time you would’ve received the last monthly payment. Another pointed out the flaw in this reasoning, which is that with the monthly payments you’re not sitting on them until the 10 years is up, you can invest that money and earn from it in the mean time. I agree with the second poster, since the first poster falls victim to the same oversimplification we made last post. From a simple ROI perspective, if you can earn better than 7.2% returns annually on your investments (which is not a sure thing, but is definitely reasonable), then you should take the lump sum. However simple ROI doesn’t consider that we could invest each of our monthly $1000 payouts as soon as we receive them. If we invest each monthly payment over the course of the 10 years, we calculate a ROIRCE value of 17%, a very hard investment to beat! The only common reason I can think of where it would be beneficial to take take the lump sum when considering ROIRCE was if you had a significant amount of credit card debt. This is because getting rid of debt is like investing at the debt’s interest rate, and credit card interest rates can exceed 20%. Using ROIRCE doesn’t add much to our analysis of buying goods on sale, since each incremental item will be held for a different amount of time, and that amount of time can be used in the traditional ROI calculation. We can calculate an overall ROIRCE for buying on sale, but we should still use the individual ROI of each increment to decide how much to buy. Deciding if it’s worth buying in bulk, on the other hand, can benefit from ROIRCE. Take the example we used in the last post where I can buy a year’s worth of toilet paper for $100, which would cost $120 if I bought my toilet paper month by month. Buying toilet paper in bulk here is like buying an investment that pays me $10/month for a year. While the toilet paper itself isn’t money I can use, each month the $10 I would’ve budgeted towards toilet paper is freed up so I can spend it on whatever I want. Using traditional ROI, we found that in this case buying in bulk provided a 20% return. However, using ROIRCE and taking into account that I can do something productive with my freed up $10/month over the course of the year, the return on buying toilet paper in bulk is 41.3%! The return is almost twice as high when considering the effect of our recurring “earnings,” so for buying in bulk we can analyze our opportunities much more accurately with ROIRCE than with traditional ROI. I recently saw a video on YouTube with advice from Mark Cuban on how to get rich. I found one piece of advice particularly interesting: that buying non-perishable consumable goods in bulk or on sale is going to give you a better return on investment than any traditional investment opportunities (stocks, real estate, etc.). Return on investment (ROI) is a financial concept – it’s a measure of how beneficial it is to tie up money in a particular investment. I was curious to calculate the ROI from buying goods in bulk, and the only example I found online of someone attempting the same calculation used a bizarre and almost certainly incorrect method. Note: technically the term for this financial concept is Compound Annual Growth Rate (CAGR). I will use “ROI” throughout this post since it’s an acronym that gets used much more often than CAGR – even though CAGR is the better measure and they’re fundamentally trying to measure the same thing: investment performance. Also, I assume Mark Cuban meant CAGR even though he said ROI. We can see that plugging in the numbers from the stock example above (an amount paid of $100, a final value of $110, and being invested for 1 year) indeed gives an ROI of 0.1, or 10%. A slightly more complicated example might be that you buy a rental property for $200,000, the property has a net income of $1,500/month, and after 8 years you sell the property for $300,000. Plugging in these numbers (final value = 300,000 + 1,500*12*8, amount paid = 200,000, and years invested = 8) gives an ROI of about 10.5%. This would indicate that the rental property was only a slightly better investment than the stock. Most traditional investments that don’t require a large amount of capital will have ROIs from 5 – 15%, so that’s the target that buying in bulk should beat if Mark Cuban’s advice is sound. It should be noted that this ROI calculation assumes you pay the total cost up front and collect the total value at the end of the investment. In reality, the rental property is more valuable than we’re calculating with this simple formula, since you collect rent over the course of owning the property, not in a lump sum at the end. This means you could be reinvesting that rental income as you receive it, and you could be earning additional returns in the meantime that we’re not accounting for. Even so, this ROI calculation is still useful for comparing different investments, and we’ll ignore this timing shortcoming for now. The equivalent of a 20% return, much better than most traditional investments! While still a reasonable return, a 30% discounted pack of toilet paper that I don’t use until 5 years later isn’t necessarily beating traditional investments. Since I have to pay extra money to be able to store the toilet paper, it completely kills the savings, and I’m left with a meager 2.6% ROI. Usually carrying cost is more difficult to factor into the calculation than this, but it’s worth keeping in mind that if a large portion of your house is being used for storage, buying in bulk probably isn’t doing you that much good, and you could lower expenses overall by living somewhere smaller without the bulk buying. By increasing my consumption by ~9%, the original ROI of 20% is cut almost in half. So while buying in bulk/on sale can provide good ROI, you should be careful about carrying costs and increased consumption, which can negate or even reverse the return. It’s also worth noting that if you buy something on sale which you normally wouldn’t buy at all, it can’t be treated as having an ROI in the sense we’re looking at here. While you can still get value from it, you’re not saving money since in the absence of the sale you wouldn’t have bought the item, and therefore wouldn’t have spent any money at all. As an example, if you’re targeting an ROI of 50%, and the laundry detergent you usually get is 40% off, our ROI calculations say you should buy ~1.3 years worth of detergent. If you want an ROI of 100%, you should only buy 9 months worth of detergent, whereas if you are happy with an ROI of 25%, you can buy ~2.3 years worth of detergent. This chart can also be used to decide whether buying in bulk is worth it. In this case, if the bulk point is up and to the left of your target ROI curve, you shouldn’t buy, but if it’s down and to the right, you should. 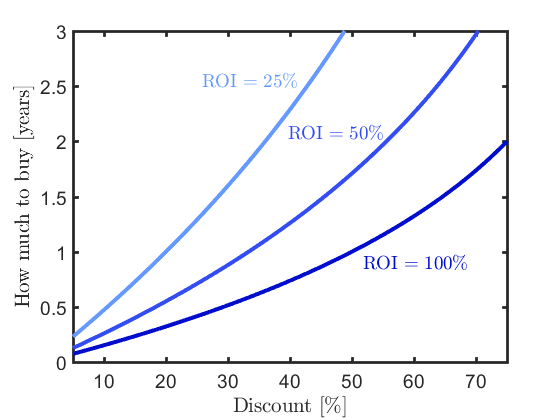 For example, if we can get a 17% discount by buying 1 year worth of toilet paper, that point is located up and to the left of all three of these ROI curves, indicating that it’s a worse ROI than any of those values (we know it’s 20% from calculating it before). Typically when you find a good investment opportunity, you want to put as much of your money in it as possible. However with buying in bulk, your investment potential is inherently limited by your normal spending, and is lower the better the discount. It should be readily evident from some of my other posts that I love Rocket League. I started playing ranked matches during Rocket League’s Season 3 (which ran from June 2016 through March 2017), and towards the end of August 2016 I started tracking my progress in a spreadsheet. I kept track of my skill ratings (similar to an Elo ranking) in the different playlists using a stat tracking website and once a week I would run through each of the default all-star trainings five times as an alternative metric for mechanical skills. I had originally had very ambitious plans for what I would do with the stats I collected, but since it’s been two months since Season 3 ended I wanted to post something before the project lost all momentum. Perhaps I’ll revisit this in more detail later, but for now the project has culminated in a simple page posted here which lets you explore different ratings/rankings over time or number of games played. My unranked rating (rating from playing in casual playlists) stayed more or less constant over all of Season 3, even though I undoubtedly improved over that time period. Looking at a playlist rating vs. number of games played (e.g., Standard rating vs. Ranked standard games played) I hit a plateau in Duel and Solo standard, but not in Doubles or Standard. Perhaps through the latter half of Season 3, my teamwork improved more than other mechanical skills, which doesn’t show up as much in Duel or (unfortunately) in Solo standard. I plateaued fairly quickly in Keeper and Striker training, while I continuously improved in Aerial training. Keeper plateaued because I quickly approached 100% completion, whereas Striker seemed to always hover around 70%. I’m not sure why I’m not better at Striker even after spending so much time on it. MIT has a fairly well known undergraduate admissions blog. I think usually it’s just anxious high schoolers reading the posts, but some have garnered wider coverage and helped shape how the world views MIT.